Our first look at the latest from auteur Paul Thomas Anderson has arrived just two months before its debut in theaters and while I'm still not sure exactly what this movie is about or what kind of thematic ground it will cover, as always when it comes to PTA, I'm intrigued. 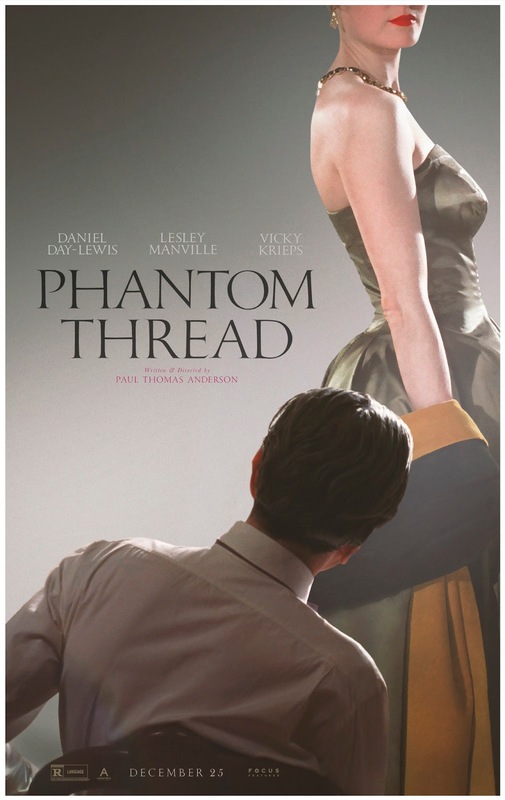 In his latest film, titled Phantom Thread, Anderson once again teams with Daniel Day-Lewis after their previous and award-winning collaboration in There Will Be Blood, to tell a story set in the couture world of 1950's London that follows Day-Lewis' Reynolds Woodcock who is a dress-maker that is commissioned to design for members of high society and the royal family. Per usual, this is a trailer for a film that likely has more going on and more varied purposes than that of whatever a short synopsis might provide. While Inherent Vice was supposedly a crime drama of sorts it obviously turned out to be less conventional and more elusive than anything Anderson had done previously and we're talking about the guy who wrote and directed The Master. While PTA's films are nothing if not divisive they can also prove to be extremely compelling and, if nothing else, should certainly be appreciated for the level of craft that is being operated on. I don't need to know much about what Phantom Thread is about or what themes, ideas, or issues the writer/director might be trying to work through with it; I just need to know that this is an authentic piece of work from a very unique voice in the cinematic landscape that just so happens to feature one of if not the greatest living actor of his generation in what could potentially be his final film role. I didn't even have to see a trailer to convince myself to watch this film, but here we are and the trailer is perfectly acceptable in that it has only piqued my interest further. It seems PTA's more definitive aesthetic style as of late suits this world of 1950's high-fashion rather well and there is a constant air of intrigue around the intentions of Day-Lewis' character and whether or not they seem to be sinister. Where this thing might lead is anyone's guess as the film comes from an original screenplay by PTA, but while the director is allowed to create such staggering works as this too seems to be I'm curious if anyone outside the film critics bubble is anxiously awaiting such a feature. Phantom Thread also stars Lesley Manville, Camilla Rutherford, Vicky Krieps, Richard Graham, Jane Perry, Bern Collaço, Pip Phillips, Ingrid Sophie Schram, Sarah Lamesch, Lujza Richter, and opens on Christmas Day. Synopsis: Set in the glamour of 1950s post-war London, renowned dressmaker Reynolds Woodcock (Daniel Day-Lewis) and his sister Cyril (Lesley Manville) are at the center of British fashion, dressing royalty, movie stars, heiresses, socialites, debutants and dames with the distinct style of The House of Woodcock. Women come and go through Woodcock’s life, providing the confirmed bachelor with inspiration and companionship, until he comes across a young, strong-willed woman, Alma (Vicky Krieps), who soon becomes a fixture in his life as his muse and lover. Once controlled and planned, he finds his carefully tailored life disrupted by love. With his latest film, Paul Thomas Anderson paints an illuminating portrait both of an artist on a creative journey, and the women who keep his world running. Phantom Thread is Paul Thomas Anderson’s eighth movie, and his second collaboration with Daniel Day-Lewis.